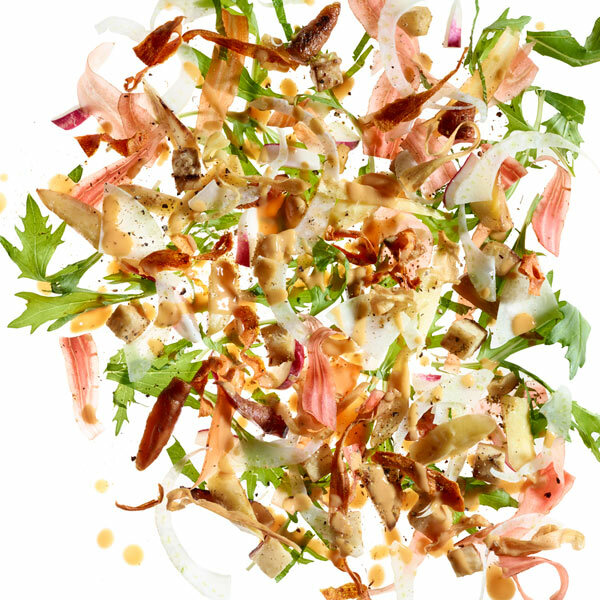 This superstar winter salad by Chef Yoni Levy is just one of the reasons we fell in love with James Beard Award–winning chef Daniel Patterson’s San Francisco restaurant, Alta CA. A hearty, complex-flavored showstopper, it includes a fried shaved-vegetable garnish that you can enjoy in any number of other recipes. With a vegetable peeler, shave the carrots into 2 cups of long ribbons and the parsnips into 1 cup of long ribbons. Set aside 1 cup of shaved carrot. Fill a small, heavy pot with 2 inches of canola oil and heat it to 300°F over medium-high heat. (It’s hot enough if a vegetable peel tossed into the oil immediately bubbles robustly but doesn’t char.) Working in batches, fry 1 cup shaved carrot and the shaved parsnip in the oil until light golden brown, about 4 to 5 minutes or until they are barely bubbling, stirring frequently; transfer to a paper towel to cool. Preheat the oven to 400°F. Dice the celery root and remaining carrots and parsnip, toss them with 1 tablespoon olive oil, spread them evenly on a roasting pan, and roast in the oven until golden and tender, about 30 minutes. Set aside. Combine 1/3 cup water and the sugar in a small saucepan and heat over medium heat until the sugar is completely dissolved. Cool. Place 1/2 cup of the roasted root vegetables in a blender with the red wine vinegar, the simple syrup, fish sauce, and sambal oelek and puree until smooth. Slowly add 1/4 cup plus 1 tablespoon olive oil to emulsify. If the dressing is too thick, add water, one teaspoon at a time, until you get the desired consistency. Season with salt to taste. Place the warm roasted vegetables in a mixing bowl with the mint, kohlrabi, fennel, radishes, mizuna, pepper to taste, and the reserved cup of raw shaved carrot. Add just enough vinaigrette to coat lightly. Toss gently until combined, season with salt if needed, and distribute between four plates. Sprinkle with the fried carrots and parsnips and the fennel pollen, if using, and serve.